Antic Teatre is, has been and will continue to be a staunch defender of artists and independent culture based on creative freedom. 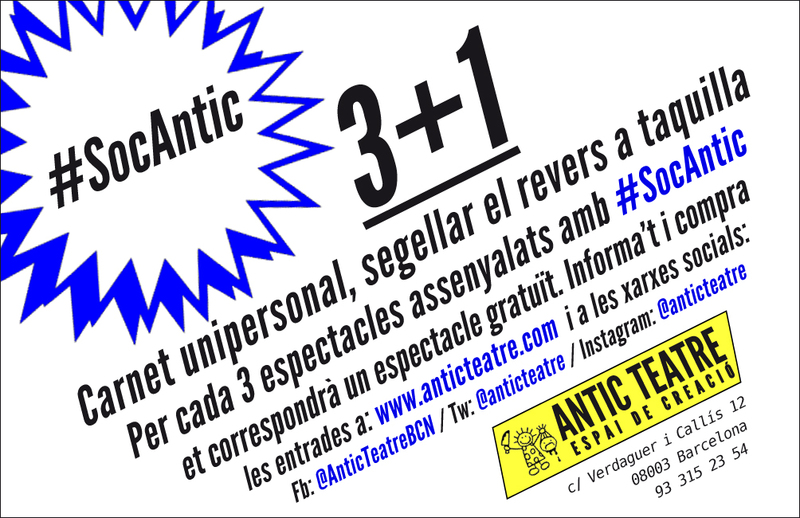 At the same time, Antic Teatre is about building, strengthening and developing its neighbourhood, its people and its audience. It is precisely the people who come here who give our programming its value. With the aim of rewarding our regular followers, we’ve been running the #SocAntic campaign: some of the events featured on our usual channels (website, posters, social networks, newsletters…) are tagged #SocAntic. Any show featuring this label is linked to the Tarjeta3+1, (3+1 Card) that can be requested at the box office and which entitles the holder to a free ticket for every five purchased. Make the most of this opportunity and join #SocAntic! The 3+1Card is personal and non-transferable. The 3+1Card is valid for a year. The previous card (5+1) is still valid and will be updated in 2019. If yours already has three boxes checked, bring it with you on your next visit and you will get in for free, meaning you can continue to accumulate stamps until you have 3 and receive your free ticket regardless of whether it’s within the same season or year. This offer runs in conjunction with Antic membership, you just have to present both cards at the box office when purchasing your ticket. It is also compatible with special discounts, see. The management reserves the right to cancel the card and to make changes to or end the campaign at any time.